With all the urbanisation which occurred along the south coast in the 20th century, Wickham Road is now the one (or only important road), which allows you to truly escape the urban area. Or until Wickham, at least. It was designated A32 in 1922, and most of it still holds that status today. A short, overlooked section is the bit at the southern end which stopped being part of the A32 in 1986. When the name Wickham Road was adopted, it extended along this previously unnamed road down to where it picks up from the High Street by Osborn Road and Wallington Hill, outside Yvery House which was expanded into the Old Manor House. It was a rural road until a short row of terraced housing was built in the 1880s, which would have probably belonged to potters. The Traveller's Rest pub is now a house. The alleyway provided access to Fern Cottages and what was the County Primary School (closed in 1978 when its virtually unchanged 100 year-old buildings were re-built, previously a girls' board school which cost 2p a day) and Church Path. There was an alehouse here. The junction with Southampton Road was added in the 1870s, which became the Wickam Road roundabout in 1986. The addition of Wallington Way took over some playing fields and a caravan site, part of which became the business park which is used by a solicitor's today. A 1950s hall was knocked down for the new road too. Serpentine Road is a 1920s addition, next to an almshouse and what was a gravel pit in the 19th century. On the right some sports grounds were converted to allotments, while the pedestrian crossing here was paid for by Sainsbury's. Historically, the road would have bared left here, on to what is now Old Turnpike. In 1872, or thereabouts, the new road to London was built to provide a more direct route which avoided the challenge which was North Hill. At this point, the turnpike was moved from the top of Old Turnpike to the new junction. The turnpike building sold refreshments, and stood roughly where the Turnpike Garage is today. It would have been removed not long afterwards as the railway had made the turnpike unprofitable and the road was adopted by the council. The terraced housing appeared at the start of the 20th century, shortly after the Fareham Union Workhouse moved here from Union Street. It became a council office in the 1930s. There was an on-site church which remained here until it became St. Christopher's Hospital in 1948, which recently closed. St Christopher's Avenue was built around it in the 1990s, over a tennis court. To the west was a clay pit and a large brickworks, which closed in the 1950s and is now an industrial estate and The Potteries. Buildings called Hugdon House and The Potteries survived, but one called The Bungalow was demolished. The cemetery was added at the end of the 19th Century and grew in to neighbouring fields. Giles Close was an Edwardian villa owned by the Giles family, split in to plots of land in the 1950s and demolished altogether in 2000. From here the road gets a bit more leafy, as it was surrounded by clay pits. The Furze Hall Brickworks on the right closed before the 20th century, and it eventually became industrial units. One of these, part of the Furze Hall Brickworks became a builder's yard, then part of the cemetery. A gap between this and Furze Hall Farm formed the entrance to Furzehall Avenue in the 1980s. The farm itself is now Furze Court. 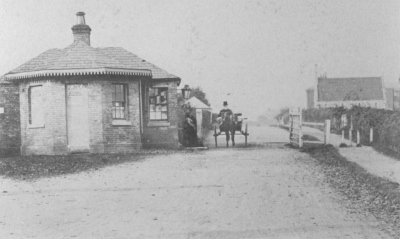 On the left was Midget's Cafe, serving passing traffic, which became part of a garage after the motorway opened. Behind it new developments were slowly added, including North Lodge which became Whiteley Lodge and High Drey. 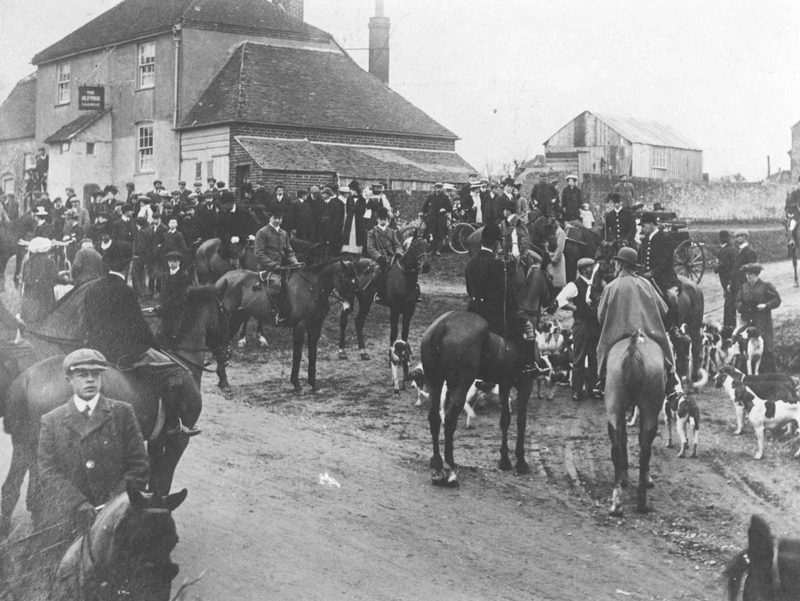 Opposite the farm were two properties called Furzehall Cottages. After this the road turned north, merging with North Hill. 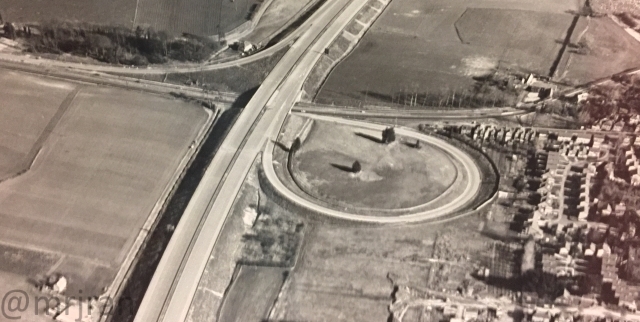 With the arrival of the motorway in 1976, what is now the underpass was dualled, and North Hill was plugged in to the side. The original alignment of North Hill can clearly be seen, and Wickham Road joined roughly where the bus stop was. The roundabout was added when Furze Court opened in the '90s. At the very bottom of North Hill was a swamp (formerly a clay pit), called Mitcherer's Pond, which was popular for skating during the winter, which was punctuated by five tall trees. It was lost when the motorway was built, and the associated change to the drainage caused Wickham Road to flood for several years. This amused residents, who had argued against the new road anyway. The odd layout at J10 (officially Roche Court Interchange) may not last much longer, but it was deliberately created to allow the motorway to serve as a northern bypass for Fareham, without other traffic exploiting the junction so they can use Wickham Road to gain direct access to the town centre. To understand why this was so important, you have to appreciate that the old route between Portsmouth and The Midlands used to involve driving through Hilsea, Cosham, Southwick, Wickham and Winchester. The M27 replaced the part between Portsmouth and Wickham, but the M3 wasn't finished for another 20 years - so you had to turn off at Wickham and take the old road to Winchester indead. When they built the motorway in 1976, they did that bizarre 1970s thing of making all the connecting roads ridiculously wide. You'd think that was sensible, but it has left us with a short bit of Wickham Road which is a random, ugly expanse of tarmac in the middle of the farms with an incredibly poor safety record. Of course, all this will change if Welborne ("Whiteley II") has its way. Gone are the fields and the North Hill Roundabout but to make up for it Wickham Road will gain three new roundabouts and a number of traffic lights. As a historian I don't like Welborne because I prefer the past to the future, but I'd urge you not to object to it just because you don't like change. Not unless you'd happily see everyone who lives in a house built in the 20th century (which is most of the town) evicted from Fareham. After all, all the houses on Highlands Road only exist because one day somebody pointed at a map and said that would be a good place to build thousands of houses. That doesn't excuse bad planning. It's just that you ought to check you're unhappy for the right reasons. Everybody wants the world to stay as it was when they grew up, but as this whole website tells you, Fareham has always changed. With that out the way, it's back to the road to Wickham as it is at the moment. It was regarded as being dangerous even then, but mainly because of highwaymen. Pook Lane, which now has a slightly diverted course, formed an alternative and undesirable route to Fareham for people not wishing to use the turnpike. Roche Court is a 13th century property that is now heavily modified and used by Boundary Oak School. The area here is mostly old chalk and clay pits. In the 1980s, the road was straightened, with the old alignment surviving as Chalk Lane, now served by the Knowle Roundabout which was built in the 2000s as part of the development on the site, that was accessed off Mayles Lane. The Old Vine Pub - now a house - dates back to the 18th century and is situated on Crocker Hill and is sadly best known for the murder which occurred there in 1924, when the landlord shot himself and his family. Crossing in to Wickham, the road becomes Hoad's Hill, gained houses in the 1930s. Much of this hasn't changed, although the three-lane hill climbing arrangement has been set to be removed for a while. Until the 1980s, the road met what was the A333 Fareham Road at an angled junction. There were plans to signalise the Southwick Road junction, but these never materialised. The fast (and fun) Southwick Road was, as described previously, the old A333 to Portsmouth. Much of Wickham grew in the 1980s. Its station on the fast line to London opened in 1903 and closed to passengers in 1955, and to goods in 1962. In 1973 the track began to be lifted after having been unsuccessfully used privately to demonstrate a new type of rail vehicle. From here onwards, the A32 once continued to High Wycombe. Despite its important-sounding number, it doesn't ever appear to have been a trunk road, but it has been a handy short-cut to London.